Zoro Feigl, Hansje van Halem and the duo Gijs Van Vaerenbergh. These celebrated makers will be working on concepts for an artwork on the A12 the coming months. The work that will arise near Laagraven will mark an area with a history that up until now was enclosed in the landscape, that of the ‘Nieuwe Hollandse Waterlinie’ (New Dutch Water Line). Near the waters of Laagraven (Plas Laagraven) along the A12 lay several elements of the Nieuwe Hollandse Waterlinie. The State cares for this heritage that might become UNESCO World Heritage in 2020 and makes efforts to create more exposure for strategic places on the line. The recreation area Down Under is one of these strategic places. On the initiative of ‘Recreatieschap Stichtse Groenlanden’, owner of the recreation area south of the A12, the State has made resources available to realize an artwork here. 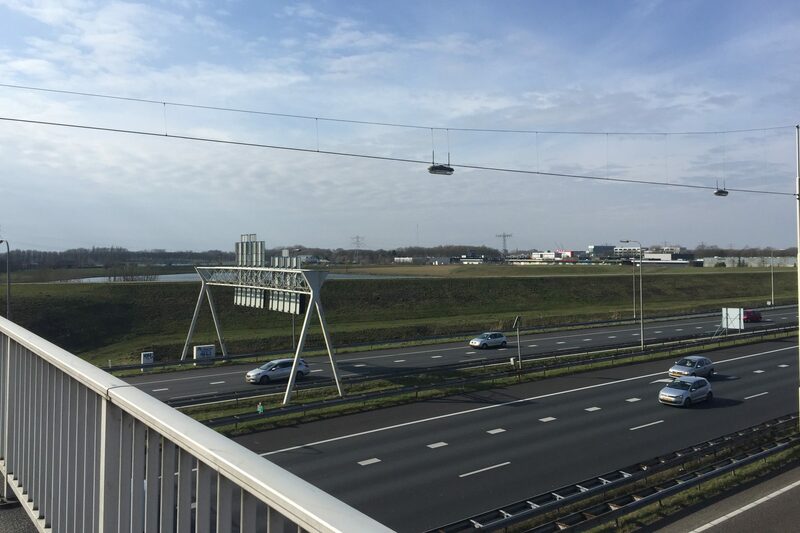 It will be visible for the 225.000 drivers using the A12 daily, for cyclists and hikers coming from the neighbourhood of Lunetten and for recreational athletes and festival visitors in the area itself. The province of Utrecht facilitates the supervision of the process and created an artistic commission to make a selection of artists. The commission chose three diverse artists on longlist, who are expected to each have their very own approach to the commission: Zoro Feigl, Hansje van Halem en Gijs Van Vaerenbergh. Zoro Feigl (1983) makes installations, monumental and subtle, in which he plays with the motion of materials that he uses and with the movement they provoke. Hansje van Halem (1978) designs typographic illustrations. She increasingly makes work in public space has been head of design of the music festival Lowlands as of 2017. Gijs Van Vaerenbergh is in fact two people: Pieterjan Gijs and Arnout Van Vaerenbergh (both 1983). In their designs the duo explores the edges of art and architecture. The artists will present their sketches tot the artistic commission in February 2019. The commission will then advise the commissioner on which artist to move forward with. According to the planning, the work should be completed at the end of 2019. We will announce which artist was chosen at the beginning of 2019.